A claymore mine set off by the Sri lanka army's deep penetration unit known as the Long Range Recon Patrol damaged a tractor transporting LTTE cadres in Nandunkerni (Wanni District- rebel held area) on the 10th. The attack killed a senior LTTE leader and wounded 5 others. The perished LTTE leader is identified as Major Kannan. Kannan was a specialist in advanced weaponry and weapons training. 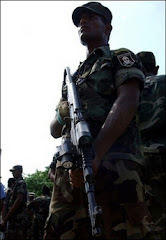 Wounded LTTE cadres are said to be receiving treatment in Mullaithiv hostipal. This is the third claymore explosion which went of in this area during the last few weeks. LTTE senior leadership has restricted public appearances in the face of increased DPU attacks conducted by the army. They have also deployed special teams to search and destroy DPU members but this has not lead to any success so far. The army's deep penetration unit (LRRP) is said to be one of the most succesful Long Range Surveillance (LRS) units in the world. LRRP units boast kill ratios as high as 300 LTTE cadres for 1 LRRP member.